My site officially went live today, so I had to blog a new wine. If this font and format look funny, it is because I am still learning! I had heard that a new local store Sprouts has a pretty nice selection of wines under $20 so I had to check it out. Those who are fans of the wine selection at Trader Joe’s will like Sprouts too, in fact… I don’t think they carried one bottle over $20. 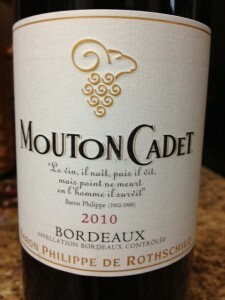 The Mouton Cadet is a Bordeaux blend I picked up for 12 bucks. As soon as I opened the bottle, I knew this one was young and could use more time in the bottle. But tonight, I was just hoping that some time in the glass would help, and it did. Black cherries, dirt, and flower petals on the nose – mostly black cherry though. The mouthfeel lives up to the nose, and is pretty huge – definitely similar to biting into a ripe black cherry… without the pit! Lots of grip on the finish, which reaffirmed my initial belief that this wine could use more time in the bottle. 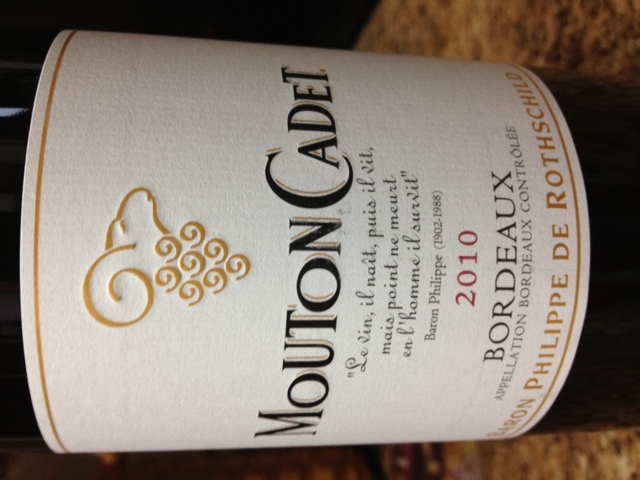 I had to pair this one with food because I rarely drink French or Italian wines on their own. I experimented a bit tonight – sauteed shiitake/oyster/crimini/button mushrooms in a bit of butter and then mixed in some camembert and gorgonzola cheese until the cheeses melted. The wine was great with the mushrooms and cheese!